With today being a remodel work-free zone in the kitchen, I was able to get a new pizza together for our weekly Friday Pizza Night! Instead of the usual flat pizzas we've been making lately, we rolled individual portions to create the Salami Stromboli we had for our meal this evening! With the pound of our homemade dough quartered, we stretched each piece out into a round and seasoned the flat, smooth tops by adding fresh grated Parmesan and a smattering of black pepper. For the salami, we went with a robust sopressata, sliced thinly, but there are many varieties out there... use what you enjoy eating! You could even go with pepperoni if you like, or even a milder cold cut like Capicola. 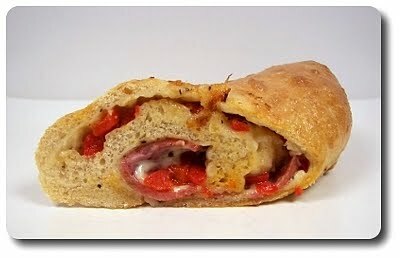 To fill out each Stromboli, on top of the sopressata we arranged thin slices of sharp provolone cheese and cubes of diced roasted red bell pepper. 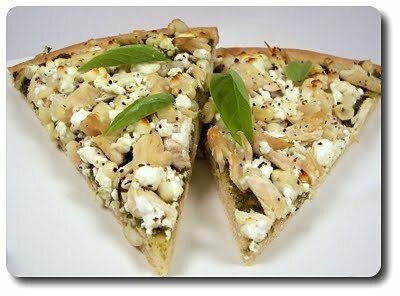 Mozzarella would be a good choice here too - either in addition to the provolone, or as a swap out. There is no special way to form these - just roll them up (not too tightly), then tuck the ends under and pinch any open seams to seal. Be sure they are put onto the pan with the seam side down. 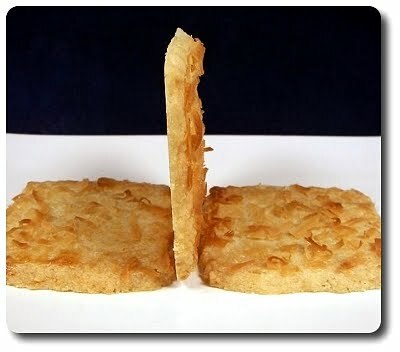 It is good to slice a slit or three on top to let steam escape while baking, but don't go too deep. I went a little too far down (mainly because I forgot to do it and remembered a minute after I put them in the oven!) and we ended up having a fair amount of cheese escapage - nothing too major at least. I was thankful for that sheet of parchment we put down on the pan first though! The suggested cook time was 30 to 35 minutes, but that was far too long for our rolls - we pulled them around 22 minutes. We thought these were certainly fine enough to eat by themselves, but Jeff or I wouldn't have turned down a bowl of warmed (spicy!) marinara sauce for dipping! Be forewarned, with the salami, it will seem and look fairly greasy at first take out of the oven. This is just the nature of the beast - try to just accept it and move on (surprisingly, it didn't come across as being that greasy on the tongue after it sat a few minutes!). If that scares you off (don't let it! 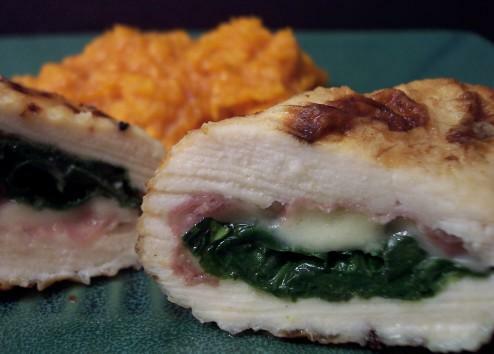 ), as I said earlier, you could use a different type of meat for the filling. With Halloween right around the corner, I asked Jeff what he would like to bring in for the Weekly Wednesday Treat Day. 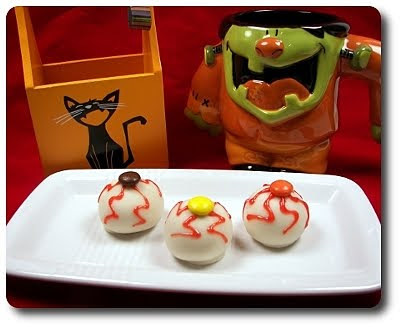 I had an inkling of what he was going to suggest, but I thought he might spring for a new goodie this year - nope, he didn't even hesitate when "Butterfinger Eyeballs" blurted out of his mouth. They are a bit labor intensive, but they always go over well and since we haven't made them for his new co-workers before, I followed through on his wishes. I didn't have much luck finding regular red gel coloring this time, so we went with what we found.... sparkle gel! What, don't bloodshot eyeballs deserve a little fancy treatment too? If you still haven't tried them, what are you waiting for? Grab a jar of peanut butter, a bag of confectioners' sugar and start chopping up bars of crunchy Butterfinger bars (saving yourself a couple, of course!) and get these made - you still have plenty of time! Since there isn't much to talk about, we thought it would be nice to post some past Halloween favorites! Maybe we can inspire you to get yourself in the kitchen and create a new tradition! 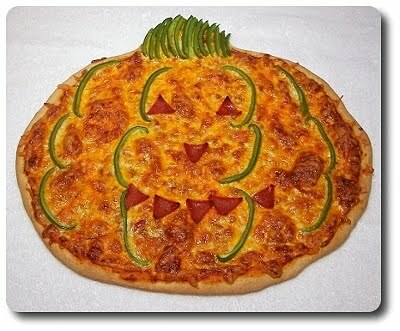 Our pumpkin pizza of 2008! Definitely fun for the little ones to not only help assemble, but eat! 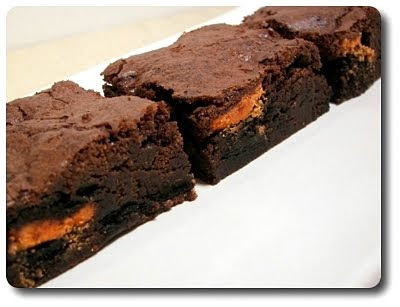 A few years ago, we took our favorite outrageous brownie recipe and made with festive by using those orange Oreo's! 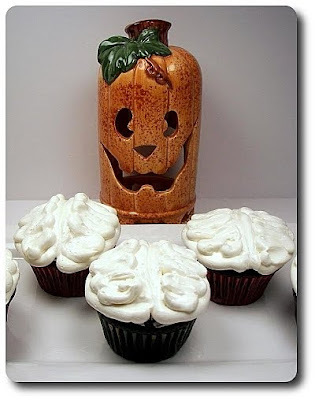 It may not scream Halloween, but you could always stamp them out in ghoulish shapes with a cookie cutter! Last year we brought in those brain cupcakes for treat day. Who knew brains would could be so tasty? Don't forget about the other pizza we made! Candy Corn Pizza! Never fear, there are no sweet candies in this pie - just a mess of cheese and pizza sauce! Chicken, steak and spaghetti... oh my! The small remodel is trudging along, with the wall finished being built and both sides painted to match the existing colors. The cabinet makers were by earlier in the week to finish up the measurements, which will hopefully speed that process so we can get this wrapped up before Thanksgiving! We're still waiting to see if we can match the granite as close as possible to the slab that was already in the house before we moved in, but I'm not convinced that's going to happen... not sure what we will end up doing in that case - anyone been through that? We've been fitting in meals when there isn't dust and debris floating around, but nothing to write home about - here are a few meals we made in recent times! 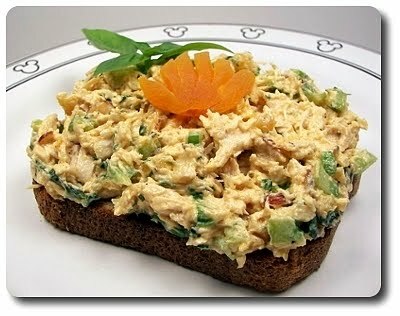 One of the dishes we made, Apricot-Basil Chicken Salad, was an interesting twist to your good 'ol chicken salad. Grilled, poached or roasted, prepare (or pick up!) your chicken in whichever fashion suits you - we went the roasted route, using a mix of bone-in thigh and breast meat, seasoned simply with salt and fresh ground black pepper. To make the salad a bit lighter, instead of your traditional mayonnaise dressing base, a greater portion of the mayo is swapped out for a plain, thick Greek-style yogurt. What also makes the dressing a bit different is the acid used, rather than lemon juice, fancy champagne vinegar is mixed in for a zesty perk. Toasted almonds (sliced or slivered), a bit of minced raw onion, a stalks' worth of diced celery find their way into the creamy mix for texture, along with dried apricots, a few leaves from the celery (bonus use - don't toss them away! 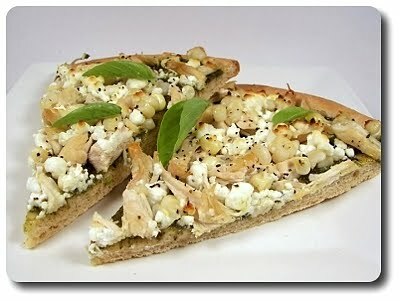 ), fresh basil and of course, the cooked chicken, shredded. We scooped this onto a hearty slice of toasted whole wheat bread to call it dinner, but if you are feeling a little decadent, think about using a warm croissant. 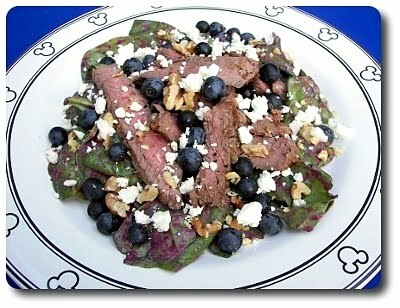 Keeping with the intriguing dressing theme, back when we picked up an overflowing pale of blueberries from the farmers' market, we threw together this Spinach Salad with Steak and Blueberries. There are a couple of specialty ingredients in the dressing that may throw you off, but you don't have to seek them out if you don't wish to. The first is raspberry vinegar, which bolsters the fruity notes from the fresh blueberries, but others you might already have should work - apple cider, red wine or sherry vinegars would be ones to think about. The next is walnut oil, which is rich and nutty in flavor, but is fairly expensive - if you'd rather skip that, canola oil works too. The steak is simply seasoned and grilled (with a fair amount pink left if you can! ), then sliced into strips to be laid on top of a bed of baby spinach leaves that was tossed with the snazzy dressing (made with said blueberries!). To finish off each plate, the tops were scattered with crumbled salty feta, crunchy toasted walnuts and, of course, a smattering of blueberries to tie all the ingredients together. Different for sure, but definitely a dynamic combination! 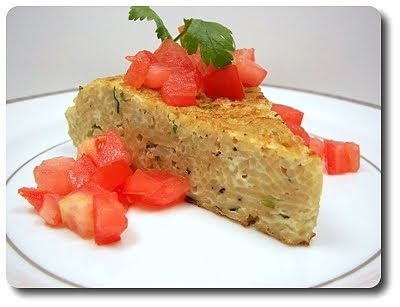 Also on our list of newly tried recipes was this Spaghetti Frittata. Use leftover plain spaghetti if you have any, about 4 cups worth, or do as we did and just cook up a half pound of nutty whole-wheat noodles. Eggs, whisked with a little milk to loosen them up, will hold all those wiggly al dente noodles together with a bit of richness, but it will need help to ratchet up the flavor. Fresh grated Parmesan cheese was a good start, and soon to follow was chopped parsley, fresh basil and a mess of onions that we cooked to a sweet golden color before we began. The recipe called for a spritz of nonstick spray to cook the frittta (using the same skillet the onions were cooked in - bonus points for less pans to wash! ), but since this is a fairly light dish to begin with, we swirled around a pat of butter to coat the pan instead. Many frittatas will have you finish them off in the oven, however this eliminated that step and has you flip the whole shebang over and cook it on the stove. This may seem scary, but be confident and just follow the directions using a plate or platter to help you with the flip. To add a little extra moisture and brightness, top the cooked round with chunky pieces of chopped fresh tomato just before serving. If you're not a fan of frittatas, I do suggest you give this a try anyway as this doesn't come across nearly as eggy - more like a noodle pie! For quite a long while, coconut was on the list of foods Jeff declared he didn't like and to be honest, I was not much of a fan of it growing up either. However, we made a Coconut Biscotti a few years ago on a whim and I found it was actually enjoyable and Jeff slowly came to the appreciate it the same. 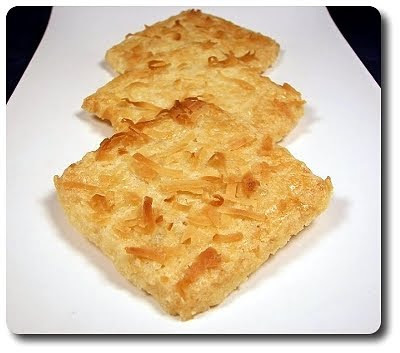 Fast forward to present day, coconut is no longer a dirty word and we have these Coconut-Macadamia Shortbread Cookies that we made for the Weekly Wednesday Treat Day to show for it. A trio of coconut wiggled their way into these cookies - shredded coconut, thick cream of coconut (think Coco Lopez - you know, the stuff to make Piña Coladas?) and a splash of pure coconut extract for good measure. Before working with the macadamia nuts, you'll will want to toast them until their pale outsides turn a light golden color - you could do this in a skillet, but I find happens more evenly if you take care of it in the oven. Shoot for 8 to 10 minutes (stirring a few times) at 350 degrees. Because you want them well distributed throughout each cookie, the nuts need to be ground first - however, with their high fat content, you do need to be a little careful as the macadamias could turn into nut butter quickly. To help prevent that, a couple tablespoons of sugar are added, along with a scoop of the dry ingredients to absorb excess oil from the nuts - be sure to use the pulse button for more control. Just as the nuts were blitzed in the processor, the same was done with a portion of the shredded coconut - this way the shreds won't become unruly when you roll and cut the dough. 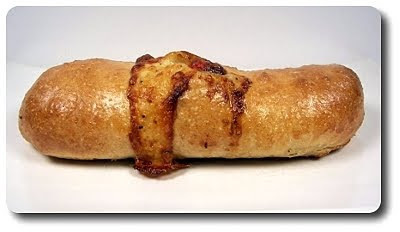 Once the dough comes together, it is fairly soft and will roll out much easier if it is divided in half, with each being rolled in saran wrap and chilled to firm up. The dough halves are rolled out to roughly 1/4" thick, but because the butter inside will have softened a bit, do yourself a favor and slide the dough sheets back into the fridge once more - not long, about a half hour will do. The re-chilled dough is then cut into squares using a fluted cutter and as long as you don't work the dough too much or use too much excess flour, feel free to reroll and cut the scraps as needed for maximum yield. 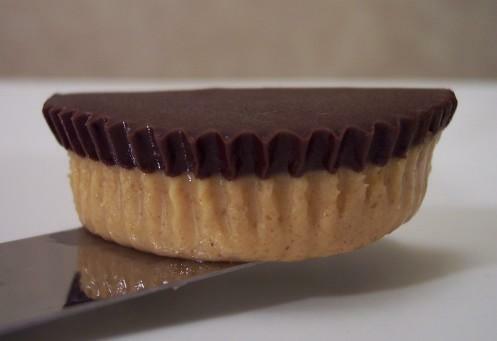 If you don't have a square cutter and still want the shape, use a ruler and pastry wheel to knock it out - otherwise, a regular cookie or biscuit cutter would work fine. Before the cookies are baked, the tops are brushed with a beaten egg white and rained on by a shower of coconut. 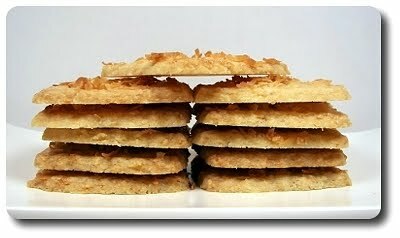 Let the edges of the cookies and coconut tops be your guide for doneness - they'll be ready when both are golden brown. Rather than whisking them off to wire racks to cool, let them rest on the sheets they baked on until they are cool to the touch. This way, the buttery cookies will be crisp out the outside, but still tender and a bit crumbly. With an in-your-face coconut attitude, you could tell what these cookies would hold as soon as you picked one up with their powerful aroma jet-setting right up to your nose. I wondered if all that coconut would be the only thing you could taste, but since the macadamias are rich enough and you've toasted them, its flavor doesn't fade away. Saying that, the nut's unique quality didn't come through as much as I had hoped - it plays more of a buttery, supportive role (and an expensive one at that!) than anything. We've done a fair amount of chocolate treats lately, so we decided to forgo any here - but, if you wanted to dress them up even more, a hasty drizzle of melted bittersweet chocolate would be an appropriate, tasty finish. It has been quiet around here, I know - sorry about that! The craziness begins again (did it ever stop?)... 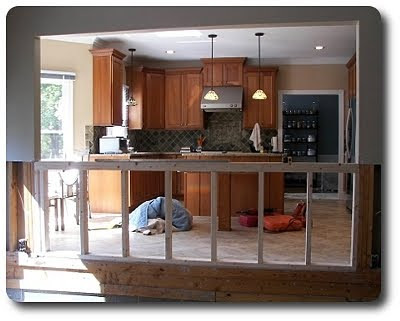 this week, contractors started working on parts of the kitchen we've been wanting to change and it has been a fairly messy process - here's a snap of the work seen from the great room. We'll post a few finished pictures when the work is complete! In the mean time, I'm still working on that list of recipes that I haven't gotten a chance to sit down and write about. 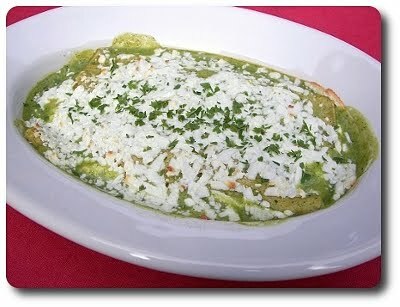 The first is a recipe we caught on PBS from Rick Bayless - Enchiladas Especiales Tacuba Style. With a fairly unique (to us, at least) homemade enchilada sauce, I went out and picked up the missing ingredients we didn't have from the market the day after we caught the episode it aired on. The sauce is made in béchamel fashion with butter, flour, milk and to keep it lighter, chicken broth, then had it's flavor dial turned up by adding fresh poblano chiles, charred over a gas flame (the broiler works well too), garlic and chopped spinach. For the shredded chicken, I had the extra time to gently poach what I needed, but you could just as well pick up a rotisserie bird from the market to make life easier. Use a good melting cheese on top - some to look for would be Chihuahua, asadero, Monterey jack or even a mild cheddar if that's all you have. We made these in individual baking dishes, but pack them in a 9" x 13" dish for a family-style presentation. With a sprinkling of chopped cilantro, we both thought this was a top-notch meal, without too much work (although, the stack of dishes in the sink said otherwise!). The next recipe I have for you is some Balsamic Baked Potatoes we had as a side recently. Halved new potatoes (if they are very large, quarter them), chicken broth, dark balsamic vinegar, ample amounts of garlic (8 whole cloves, smashed!) and sprigs of fresh thyme were placed in a square pan, seasoned with salt and pepper, then baked long enough until the potatoes were plenty tender and the once liquid-y concoction reduced to a glaze. 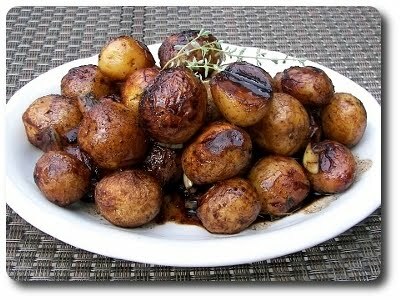 We thought these potatoes were good, especially how hands off this was to make with all of the work being taken care of in the oven. If I had any tips on this, I'd suggest you line the pan with foil as the glaze bubbles and splatters often, making for an awful clean-up process of the baking dish. For the last recipe we have to share today, Open-Faced Sandwiches with Ricotta, Arugula and Fried Egg, we actually had as a late breakfast on a lazy Saturday morning. With a slab of crusty and toasted whole-wheat bread for a base, the top was slathered with creamy ricotta that was smashed with sharp Parmigiano-Reggiano cheese, fresh thyme leaves and just enough salt to highlight the subtle notes in the ricotta. On top of that layer was a light salad of peppery arugula, tossed with extra-virgin olive oil, bright lemon juice and of course, the obligatory pair of salt and fresh ground black pepper. 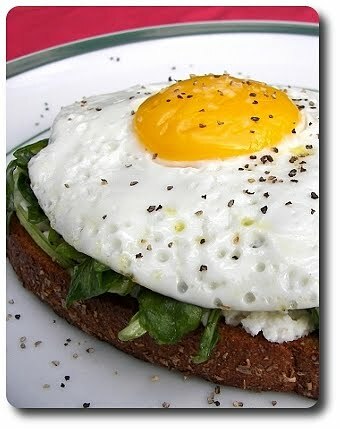 For the final layer, and Jeff would say, most important, a fried egg that cooked just long enough to set the whites, leaving the yolks soft, fluid and decadent, was then slid directly on top like a flashy beacon. This would definitely work well for dinner, but it made for a fantastic breakfast that kept our stomachs happy and content for quite some time - I think we'll be making this snazzy dish often! With another treat day upon us, I had to figure out what we were going to send in this week...and since apple season is in full swing (though it seems it is already ending out here) it was only natural we looked in that direction for ideas. Whenever we go to the orchards, they always have plenty of cider doughnuts (or donuts, if you so choose) on hand, making it impossible to resist picking up a few to munch on for energy (yeah, right) after a long morning of grabbing apples from the trees. We ran with the doughnut idea, but instead of submerging them in a vat of oil, we decided to go a bit lighter and make use of some old baking pans we had laying around, making these Baked Apple Cider Doughnuts. Highlighting the essence of fall, inside the batter you'll find not one, but two apple infusions - the first comes from spicy apple butter, while the second comes in the form of unfiltered apple cider (and if you can find unpasteurized, all the better - you'll most likely only find this at an orchard though). Before you ask, you might be able to get away with apple juice, but cider is more rich and developed, so if you opt for juice, it may lead to a weaker apple-flavored doughnut. 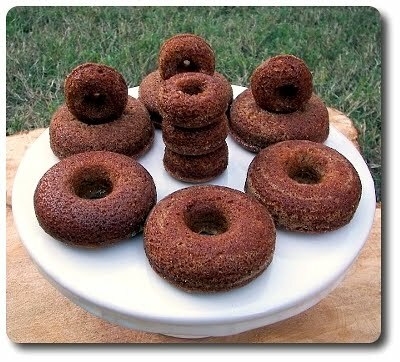 You'll also find plenty of cinnamon in the doughnuts, along with pure maple syrup - to keep them moist, a scoop of thick, Greek-style yogurt also joins the mix. We used a large and small doughnut pan for this, coating them with nonstick spray and sugar before filling them. This makes more batter than will fit in both, so as soon as they had baked and were taken out of the pans, we washed the large pan in cool water, then repeated the same process, with enough batter leftover to make three more large. If you don't fill all of the wells with batter, add a little bit of water into the empty ones so they don't scorch. 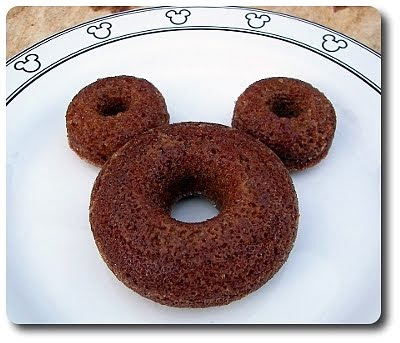 These doughnuts may not have the same texture as the indulgent deep-fried variety, but don't discount them for that reason - they are still moist, fluffy and full of flavor. Coating the wells of the pan with sugar does help with releasing them from the pan, but it also gives them a fun, sweet crusty top that I would miss if it wasn't there. 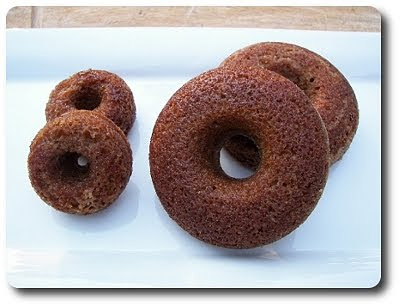 If you don't have any doughnut pans and would still like to give the recipe a shot, try using miniature bundt pans. Besides getting bonus points for not being nearly as messy if you chose to fry them, you can ditch any guilt from eating one of these beautiful rounds by baking them - you could even incorporate a bit of whole-wheat pastry flour if you like! You could dip the tops of the doughnuts with a simple confectioners' sugar, vanilla and milk (or even maple syrup to continue the theme) concoction if you like, which was our initial plan, but after giving them a nibble (okay, more like eating three each), Jeff and I both thought a glaze would make them a bit too sweet for us. Sweet potatoes... have you thought of using them in other fashions besides chunky fries, mashing them as a side for dinner or slappin' the spuds in the oven whole? 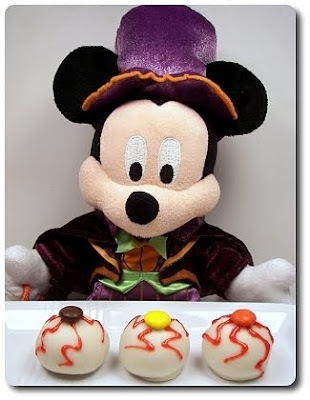 Sure, in savory courses they are fairly well known, but how about sweets? There is always sweet potato pie of course, but I've never really put much thought into using them for other desserts, that is until we made this Sweet Potato Pudding Cake! You'll need about 1 3/4 cups of the sweet potato, mashed plain, that you can accomplish in a couple ways - baking them or using the microwave to speed up the process. Since you won't be needing the skins, the microwave does an excellent job and the soggy skins won't be an issue - but if you're already using the oven for another project, toss them in for about an hour. I did this the night before since we had to turn the oven on for dinner, then kept the mashed 'taters in the refrigerator. Before we started assembling the remaining ingredients for the cake, the raisins, which are added near the end of mixing, need to first take a dip, but they won't be swimming in water. To give them a juicy spark, the little guys are covered with a couple tablespoons of dark rum and sit happily until called for. 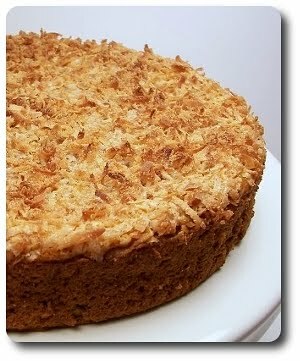 There isn't much flour in this "cake" - only a cup used, which bound the mashed sweet potatoes together, along with a few eggs, brown sugar, a couple tablespoons of melted butter and a can of light coconut milk. We use a combination of all-purpose and whole-wheat pastry flour to work in a bit of whole grain, but use completely all-purpose if you like. Slightly sweet fresh grated nutmeg (please do yourself a favor and find whole nutmeg to use - grating them fresh with a microplane, or even the small holes on a box grater, makes all the difference!) is also tossed into the batter as the warming spice of choice. Not everyone is a fan of nutmeg, especially when it is overused on a glass of Eggnog, and if that is the case for you, think about switching it out for ground ginger or even cinnamon - it will be a different profile, but good nonetheless. Stirring the plumped raisins, along with any extra booze left behind, into the batter, the thick mixture is scraped into a springform pan and has one more addition before it is ready to bake. For a sweet, crunchy topping, shredded coconut, a couple scoops of brown sugar and a hint of cinnamon are jostled together, then sprinkled as evenly as possible over the top. There is a 15 minute gap on the bake time as the moisture level from the potatoes will play a factor into doneness of this cake - check it at the earliest time by sliding a thin knife into the center. If there is still sticky batter clinging to the knife, give it more time, checking every 5 minutes or so - the knife should come out pretty clean. Between the brown sugar, sweet potato and raisins, I began to wonder if the sweetness level would be off the charts, but I was surprised to find that just wasn't the case - I think the coconut milk suppressed any cloying aspects to instead let the inherent flavors come through and dance on the tongue. 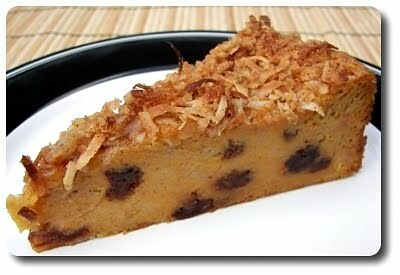 The cake is dense, but not heavy - kind of like if you mashed a moist cake with a luscious cheesecake. 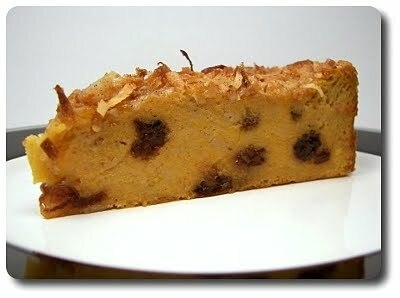 The rum-drenched raisins hit the spot as we found them in each forkful of this pudding cake, but don't be tempted to tamper with them... go out and buy a little nip from a liquor store if you don't have a bottle. We have the freezer to thank for our Friday Night Pizza this week as I pulled three of the main ingredients from there! I wasn't going to be home in time to get this Chicken and Goat Cheese Pizza With Fresh Basil together in time to eat at a decent hour, so I cooked the chicken (which was trimmed and portioned in the freezer from the a Costco trip a couple weeks ago) last night and left it to chill, par-baked the pizza crust this morning before breakfast (early riser!) and moved the corn and pesto from the freezer into the refrigerator to thaw. All I had to do when I got home this evening was preheat the oven, top the crust and after a good 10 minutes in the oven, bang! Dinner was ready! The pesto, made in a giant batch last week to use up the last of our basil plants, made its way onto the crust first, followed by the shredded chicken, thawed corn kernels we had cut from the multitude of ears we garnered from the farmers' market during the summer, crumbles of goat cheese and for a little extra richness, a hearty drizzle from a bottle of quality extra-virgin olive-oil. 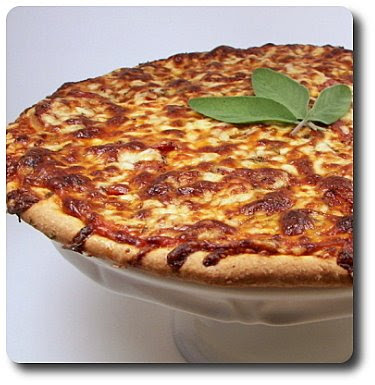 Seasoned with a sprinkle of salt and fresh ground black pepper, the pizza needs to bake just long enough to finish off the crust and give the tangy cheese crumbles a tinge of golden brown color. 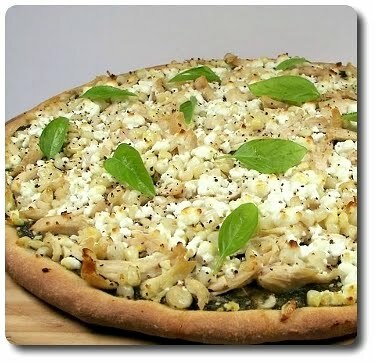 For a note of freshness, and to tug on the pesto layer underneath, as soon as the pizza was swept of the stone, we scattered the top with basil leaves and called it done. If you like a softer crust, and don't need to rush as I did, feel free to stretch the raw dough out and scatter the toppings on, then tack on a couple extra minutes to the bake time, if needed. The original recipe did call for a half cup of portobello mushrooms, browned in a skillet with a touch of oil and salt, but honestly it didn't appeal to me (nor Jeff, surprise surprise!) and we didn't feel the pizza suffered - if you groove on them though, go for it! 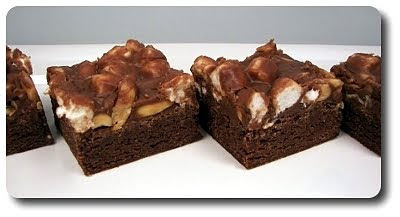 Chocolate, marshmallow and peanut - this is a combination I've had (and pigged out on) many times, but never meshed together quite like the treat we made for the Weekly Wednesday Treat Day. 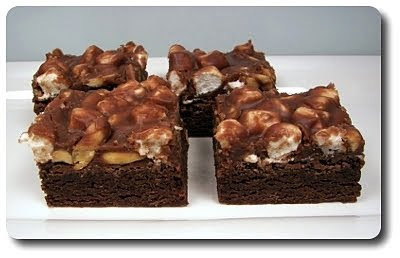 I'm not sure if I would have made these Fudgy Rocky Road Brownies if it were going to be only for us, just for the simple fact that Jeff and I don't always have the will power for this type of treat. Thankfully, though, this weekly tradition allows us to try them out, keep a few for us, then get the majority of them out of the house! There are no surprises in the brownie base, made with potent unsweetened chocolate, butter, sugar, fragrant vanilla, a few eggs, flour, baking powder and of course, a good almount of salt to allow the flavors to bloom. Usually I'd be inclined to add a spoonful of instant espresso powder here, but since these brownies are pretty over-the-top, I figured keeping the base a little less intense might be a good choice. If you'd like to add it though, try a heaping half teaspoon or so, stirred in once you've melted the butter and chocolate together. When the brownies had almost baked through in the oven, the ridiculous (in a good way!) topping comes together in a saucepan by melting together more unsweetened chocolate with butter, cream cheese and a splash of milk. When those ingredients were smooth, off the heat a mess of confectioners' sugar and vanilla was stirred in to tighten the topping to a loose frosting consistency. This gives the mixture a chance to cool slightly, making it a snap to mix in the puffy miniature marshmallows and salty peanuts, without turning the marshmallows to goo. To help this topping cement to the brownies, you'll want to scoop it on top of the hot brownies and use a gentle hand to spread it over the top. I used a spoon to drop medium dollops off all over, then took our trusty off-set spatula to connect the dots. Be sure to give them several hours to set and firm before even contemplating cutting them into bars, unless, that is, you'd just like to eat them out of the pan with a fork (tempting!). 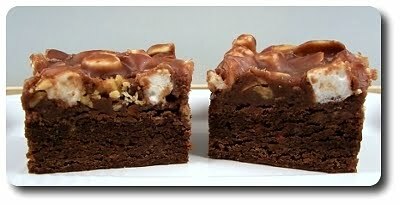 The bottom of the brownies is dense, with a center that is moist, a touchy chewy and definitely fudgy - just be sure you are watchful to not over-bake the base! The flood of creamy frosting, marshmallow and peanut on top firms up enough that it won't run off after being cut, yet it doesn't turn rock solid either - it stays soft and well, frankly, dreamy. We used our rocker to dissect the brownie slab into thirty lavish portions, but they are surely rich enough that smaller squares would be appropriate. I do have one problem with them... Jeff is now trying to come up with a devious plan to figure out how to "lose" them on the way to work so he doesn't have to share - they better make it! 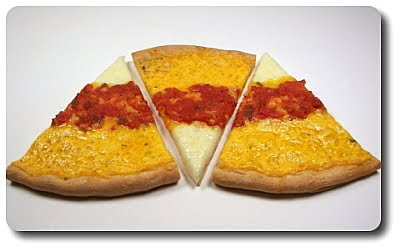 Pizza night is a repeater this week - for tonight, Jeff requested that Calabrese Potato Provolone Pizza. We had an appointment for Gus set up at the vet (routine!) and the only time they had available was just about the same time Jeff gets done with work. Time-wise this was good since we only have one car and the vet is not that far from his office, but it also meant we were going to arrive back home a fair amount later than we usually do. Knowing I was going to be pressed for time to get anything on the table for dinner, I made sure not to pick out anything too complicated or time consuming. 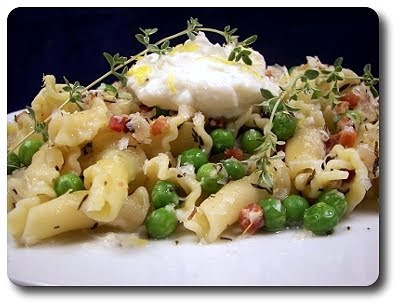 I try to keep a pile of untried recipes set aside for nights like this and that is exactly where I went, finding this Campanelle with Pancetta and Peas recipe to make. To move this dish along as quickly as possible, as we dropped the little pasta flowers into a pot of boiling, salted water to cook, we already had another skillet on the stove heating a small pool of extra-virgin olive oil. Into that skillet went tiny cubes of pancetta (like bacon, but not smoked - you could use bacon here too if you can't find pancetta) to brown. Chopped onion joined the pancetta and as soon as it had a chance to soften, a mess of garlic was stirred in. Four cloves were enough for us, but I think there is plenty of room to adjust - a little more for those garlic fiends and a little less for the timid. For a hint of acidity, a small glass of dry white wine made it way into the skillet - however, if you don't cook with alcohol, you could use chicken broth instead - I would just add a splash of mild vinegar to compensate. Frozen peas, a couple cups worth, was the next ingredient to hop into the skillet and as soon as the green balls had heated through, fresh thyme and the zest of a lemon were the last additions to the "sauce" components. 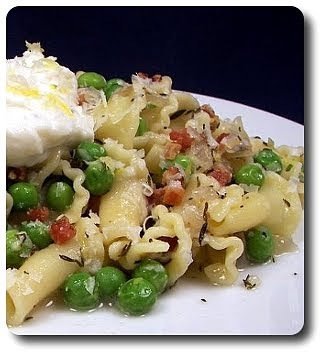 The pasta, along with enough of the now-starchy water to coat, was brought into the same skillet with the vibrant peas and was left over low heat for just a minute to bring everything together. I did give a range on the amount of pasta - since there is plenty going on, you could easily get away with twelve ounces worth and be fine, though we did go with the full pound for a generous six servings. If you have trouble finding campanelle, try using the ear-shaped pasta called orecchiette. With a handful of salty pecorino-romano cheese to round out the dish, we portioned out servings into warm plates and gave them one last addition - a hearty scoop of sheep's-milk ricotta cheese. 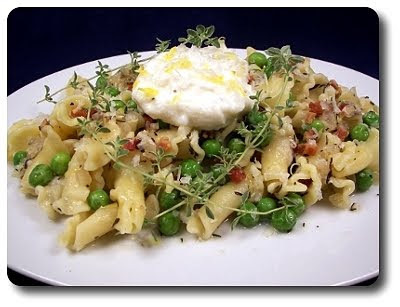 You could go ahead and stir the ricotta in at the last minute, but try serving it as a large dollop on top of each plate instead - this way, you can enjoy the creamy texture and delicate, tangy flavor of the ricotta against each bite of this zesty pasta meal. If you do happen to have extra lemon zest, sprinkle the shreds over the ricotta dollop for extra zing.